The EU is facing some tough decisions in the face of the eurozone crisis, but even forcing some countries out of the euro may not be enough to save the union. The eurozone is going through three crises at the moment: a banking crisis, a currency crisis and a sovereign bonds crisis, and whatever response the union chooses in response to the tough economic situation, it will have political consequences. The eurozone was originally built on a conflict of interests. With the foundation of the union, countries with powerful economies, such as Germany, France and the Netherlands, gained access to the vast European consumer market, which accounts for 17 percent of all purchases made in the world. The introduction of the eurozone also created new consumers of the countries that do not produce sufficient commodities and services – Greece, Portugal, Italy, Spain, Ireland and the Eastern European nations. But these nations are dependent on imports, which they buy with money they borrow on the capital markets. For many years, it seemed as if this scheme might work forever. But nothing is infinite in this world. This money has owners – a bank from France, a business in Germany or a farmer from the Netherlands. It is a vicious circle. In order to understand the potential scenarios for the further development of the euro crisis, it is necessary to take a look at the fundamentals of the Greek economy. Greece is objectively one of the least developed economies in Europe, and the reasons for this are not limited to the country’s national mentality, short working days and lack of natural resources. Since 1960, Greece has turned into an industrial-agrarian economy as a result of inflows of foreign capital, state policy encouraging the development of big industrial enterprises, and the expansion of foreign trade. Sea transport, including international freight by Greek ships, and international tourism, account for about 50 percent of the Greek economy. Today, the state holds a considerable share in the Greek economy, controlling 77 percent of the Agricultural Bank of Greece and 34 percent in Hellenic Postbank, as well as blocking or controlling stakes in the electricity and telephone monopolies. Furthermore, the state owns the DEPA national gas company and the DESFA natural gas transport operator. Finally, the government owns the country’s cargo ports, the OPAP lottery and betting monopoly and real estate. Italy is not in much better shape, although it has different problems. According to Nouriel Roubini, an economic adviser to U.S. President Barack Obama, under the circumstances, Italy’s only option may be to give up on the euro and go back to the lira, even if this move triggers a break-up of the eurozone. At least this is what the economist wrote in his Financial Times column. The surging rates on Italy’s sovereign bonds mean a rising risk that Italy might lose access to the debt market. This, in turn, could lead to a forced restructuring of its 1.9 trillion euro public debt, given that the economy is too big to fail but also too big to save. A default or partial debt remission would address the debt burden problem, but it would not resolve other economic problems, including corruption, the large current account deficit, lack of external competitiveness and a plunge in gross domestic product and economic activity. Italy will not escape default – which is the correct term for not being able to repay debts, fully or partially – without EU financial injections. The country will retain access to capital markets but the interest rates on its sovereign debt, which have topped 7 percent, will ultimately prove unaffordable and Italy will stop borrowing for a year at the most. To address the current problems, the eurozone needs to bring out some big guns: a cash reserve that would prevent Italy, Greece and other potential countries from sliding towards insolvency. But Europe has no such reserve. Germany and France have their own problems and challenges on which to spend their money. The possible options suggested by the markets – common eurobonds, issuing additional euros or financial multipliers – are out of the question given Germany’s position and complications with the collective treaties of the European Union. 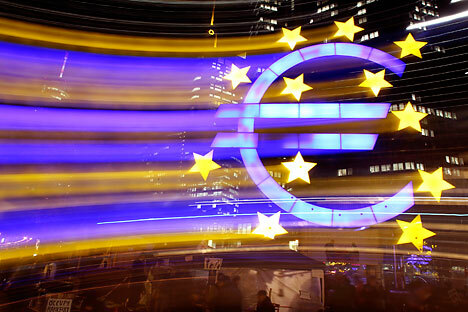 The eurozone will have to impose severe financial and economic caps for eurozone members, for example, limiting annual inflation rates to 3 percent and public debt to 100 percent of GDP. If a country fails to meet the requirements, it automatically loses the right to issue the euro starting from the following quarter. As a result, Greece would be the first economy to be expelled from the eurozone but not from the European Union. Portugal, Spain and Ireland will follow, and finally, Italy’s time will come. It seems that the most viable option is to form a consolidated eurozone core with a common financial and tax policy that would unite the few economically sound nations. The creation of a federative euro-union based upon Germany, France and the Benelux nations is one possible way to prevent disaster. But it is a hard decision and would require new limitations on national sovereignty, which not all EU member-states will be ready to adopt. And in this scenario, federalization of the Eurozone may result in the disintegration of the European Union. Stanislav Mashagin is deputy general director of the investment firm Ursa-Capital.